A case study on how Fogo de Chão stimulated consumer and media interest in the brand leading up to, during, and after the Olympics - all without being an official sponsor. Without the advantage of being an official sponsor of the 2016 Summer Olympic Games in Rio de Janeiro, Brazilian steakhouse Fogo de Chão was able to create a successful campaign that hinged on the brand's Brazilian heritage. Fogo and its PR partners used hospitality and a well-positioned microsite to develop relationships with media outlets, including official Rio Olympic broadcast network NBC. Fogo was able to stimulate consumer and media interest in the brand leading up to, during, and after the Olympics. Fogo and ICR recognized that the 2016 Summer Olympics presented an opportunity to leverage the global excitement surrounding Brazil, its culture, and culinary history with the brand's own Brazilian identity. The campaign team began planning for the campaign in April 2016. ICR and the Fogo de Chão comms team wanted to develop a unique campaign that would create connections with Olympic guests and media, drive awareness for the brand, increase traffic to restaurant locations, and stimulate interest in Fogo de Chão, its menu offerings, and brand attributes. The PR team set out to highlight the restaurant’s authentic roots, churrasco menu and Gaucho chefs with national, regional, and trade media. Churrasco is a Brazilian style of grilling featured in Fogo restaurants, much like hibachi would be to a Japanese steakhouse. "When thinking from a strategic aspect of messaging, we can talk about cuisine and we can talk about culture, dining etiquette, and key phrases because we are from Brazil," explained Seth Grugle, VP of consumer PR at ICR, speaking on behalf of the brand. "Much of Fogo's senior leadership and many of our Gaucho chefs in America are from Brazil as well, so that's really what we wanted to get across with this campaign." ICR created the concept for a special website dedicated to all-things Brazilian cuisine and culinary culture. This "guide" would help position the brand as a source of knowledge to Olympic fans and also established the brand as a leading resource for Olympics features and media coverage involving Brazil, its culture, and cuisine. ICR also looked to execute a launch event for the guide in advance of the Rio opening ceremonies. 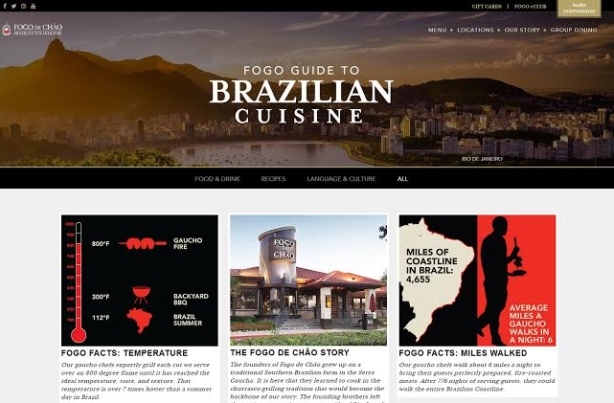 The site, called the Fogo Guide to Brazilian Cuisine, was developed in partnership with Levenson Group. It included insights ranging from language lessons and local customs to dining tips, all designed to enhance the celebration of Brazil for anyone traveling to Rio, or looking to enjoy Brazilian hospitality at home. The campaign team held a launch event for the Fogo guide on July 12 at the restaurant's Manhattan location. The event brought 46 media editors, reporters, and producers together with the Fogo executive team to enjoy the churrasco experience and get a "sneak peek" at the guide before it was officially published the next day. Nearly all attending media published features or segments following the event, including Good Morning America, Food Network Magazine, Forbes.com, Nation’s Restaurant News, Complex, and Cosmopolitan. In addition, many of the attending media posted photos from the event to their social media channels. On August 5, Fogo de Chão reached a business audience when CEO Larry Johnson, the Brazilian Consulate, and fellow Fogo team members rang the opening bell at the NASDAQ exchange in celebration of the Olympic opening ceremonies. The bell ringing was broadcast live on CNBC, Fox Business, and Bloomberg Television. As the official Rio Olympic broadcast partner, NBC was a major media target for Fogo. "We met with food beat reporters and sat down with Olympic segment producers at NBC," said Grugle. "As an extension of Brazilian hospitality, which is a big part of the Fogo brand, we wanted to make sure that if there was anything they needed, we were there as an authentic voice or helping hand." The Fogo de Chão story piqued the interest of Ryan Seacrest, who produced three vignettes with the brand for his late night Olympics program. The team at Access Hollywood also worked with Fogo de Chão to produce two segments leading up to and during the games. The campaign team leveraged branded Fogo social media channels in order to drive attention to the guide microsite. In addition, the brand launched several Facebook Live events with Woman's Day magazine, including a tasting at Fogo de Chão in New York City. The brand made its national morning show debut on Good Morning America on August 6, as result of connections made at the New York media event. The brand also saw six segments on the Today show on NBC. Campaign efforts resulted in 120 feature placements and 13 national broadcast segments. Thus far, the campaign has garnered more than 3 billion media impressions, measured across both social and traditional outlets. Also, as a direct result of pre-Olympics meetings coordinated by ICR and Fogo de Chão with producers at NBC, journalist Tom Brokaw elected to produce a vignette titled "The Gaucho Way" that documented the history Fogo de Chão and the art of churrasco. The vignette aired August 20 during primetime NBC Olympics coverage and featured Brokaw riding horses with Fogo de Chão’s founder. The relationship between Fogo and NBC grew so strong that, while in Brazil, NBC asked Fogo de Chão to cater the network’s Olympics wrap party. Fogo is publicly traded and earnings reports for the period of the Olympics have not been released, therefore traffic measurements to brand locations as a result the campaign have not yet been made available.